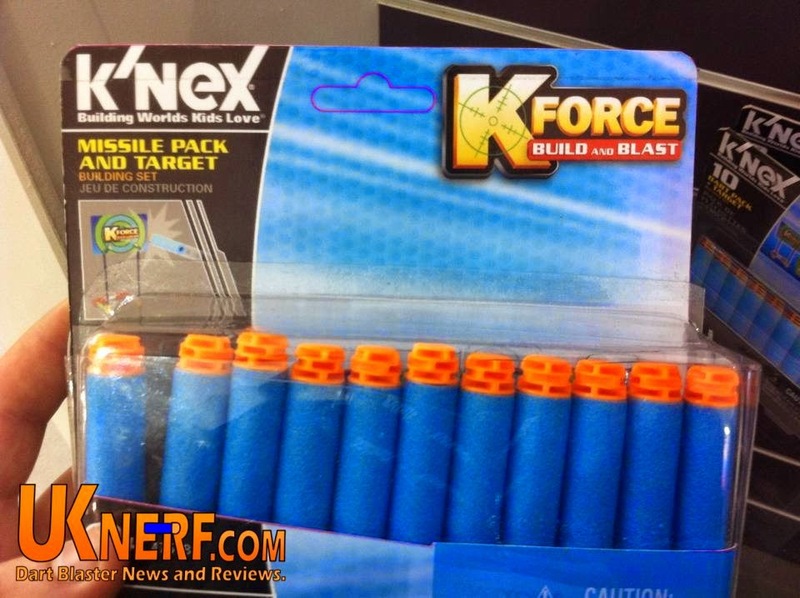 Why has K’Nex started building blasters? Well, first and foremost, they were keen to stress that first and foremost, K’nex is a construction company. However, they have been seeing a huge amount of search hits for blasters that people have been making, utilizing their parts as a base for construction. In response they have decided to expand into this in an official capacity, both as a way to better facilitate the utilization of their parts in such a capacity, but also to keep it safe and regulated for children wanting to do this. It was very refreshing to hear they have decided to market them as just that, another set that people can customize straight out of the box and combine them with any amount of other sets. 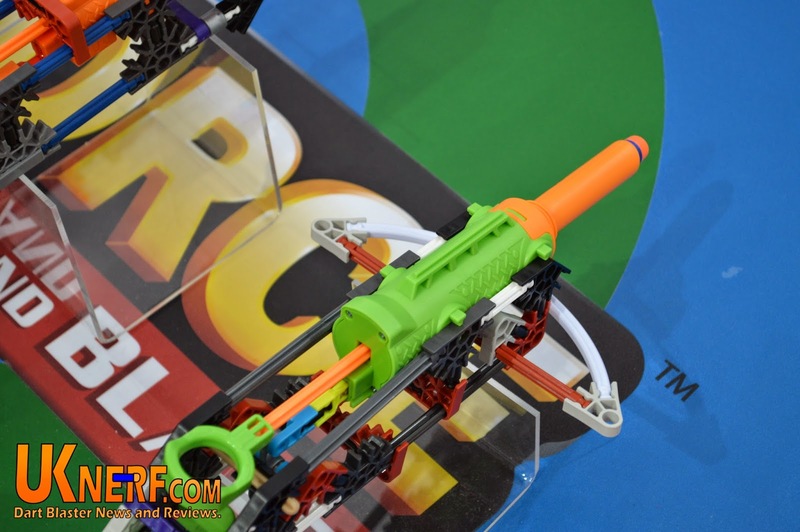 You want a K’Nex robot that can fire darts? You can build it. 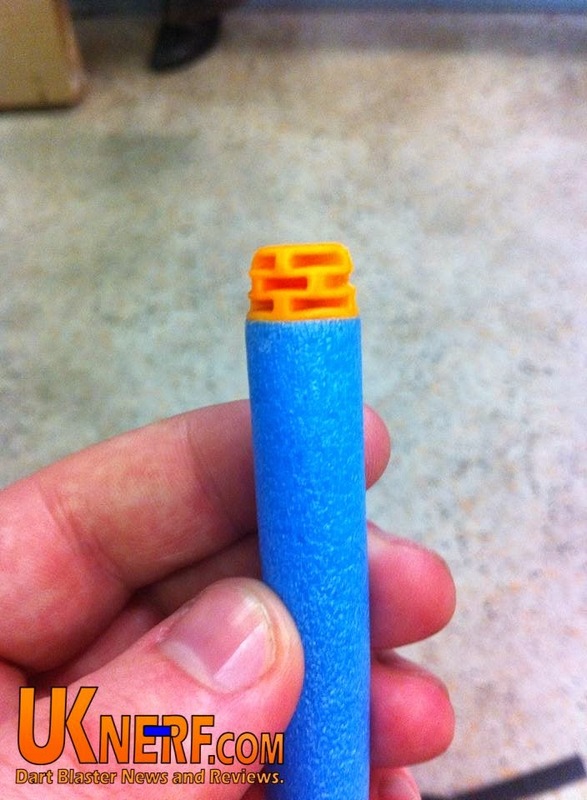 They have (rather interestingly) decided to go with a dart that is to the same size and shape specification as NERF Elite darts, to the point where the demo set up in the stall had buckets of both. The tip feels weightier than the Elite darts, and is of a honeycomb shaped whistler design. I was given a few to take home, so expect more info during a roundup to come later. First impressions are very good with how this dart handles. They will be sold in packs of 10 and 30 so they will compete with Hasbro, along with an included target that can be easily mounted on K’Nex pieces, as displayed by box art. 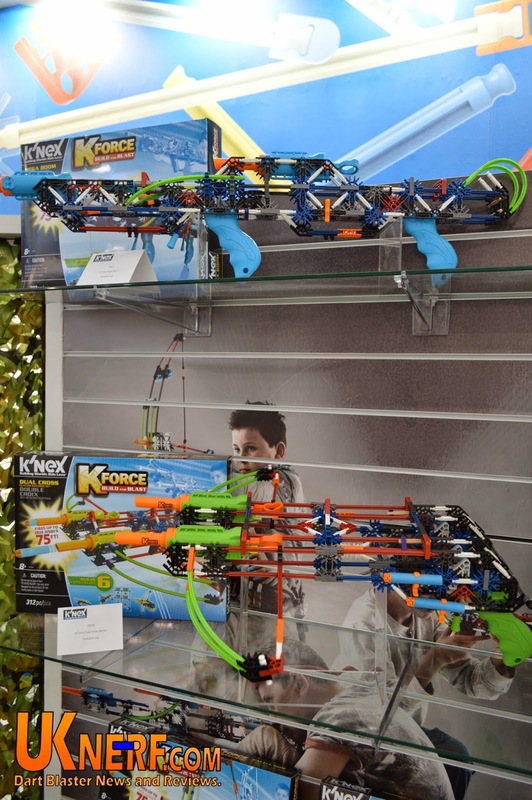 All of the construction sets in the K-Force range share the same 'blaster' which is essentially an inline Jolt. Single shot blasters, that operate on a simple plunger system. They have connection points all over so they can be easily integrated into a blaster design. I asked about motorized designs, and the response I got was positive – they were looking into it, but it would depend entirely on how well their current lineup did. They did mention an automatically cocking and firing “Gatling gun” they had created in mock ups, but for now they are very much focused on giving the power to create and discover to the user, rather than just a set of instructions. That being said, they were extremely keen to point out that each larger blaster (shown below) had multiple suggested build ideas packaged with the blaster. Before reading onwards, with regards to ranges – when questioned on how their ranges would compete with Nerf Elite ranges (90ft), they stated that the advertised ranges were in order to meet with global standards, unlike Nerf (see grey/orange trigger blasters and difference in power there). They could have different ranges for different regions, but this would overcomplicate what is, at it’s core, a children’s toy. Downloadable instructions for combo build. I really liked these. They were simple, sturdy, and had a satisfying snap to them when they fired, something seen throughout the line. They could also be combined when bought with the other blaster. This blaster will be the baseline, and will cost £14.99. Download instructions for 3 custom alternate blasters and buildable targets. These sets comes with more parts than the previous ones but crucially, no additional blaster components other than the dart holders. You could argue that if you already own a lot of K'nex sets, these are not really worth while. RRP will be £24.99 for these which is a considerable jump for not a lot extra. Download able instructions for 5 custom alternate blasters and buildable targets. Both of these sets will be £39.99 which is a considerable investment for any toy. Although you get more than twice the total pieces of any other set, I can't shake the feeling that you're not really getting value for money at this end of the range. As I mentioned earlier, if you already own some K'nex parts, you could build these blasters using two of the entry level sets and save yourself a tenner. I for one am really looking forward to these blasters, and I hope that they are successful. 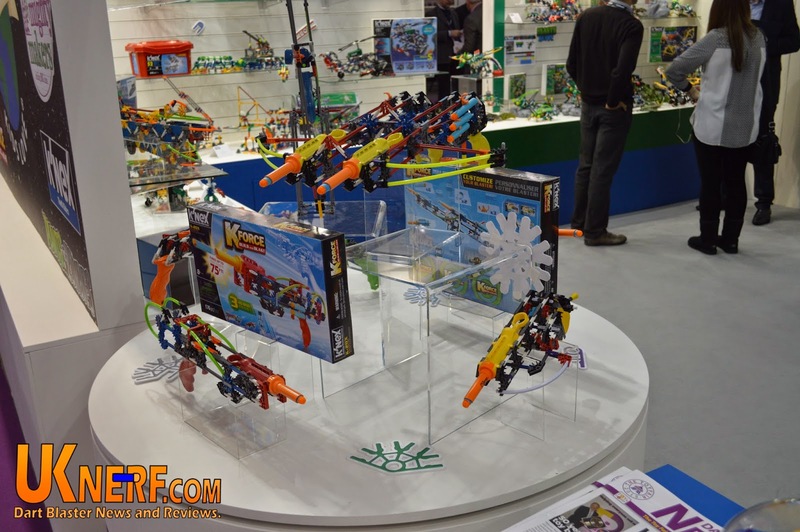 The more successful they are, the more encouraged K’Nex will hopefully be to release motorized components, more chambers rather than just single shot, the list goes on. 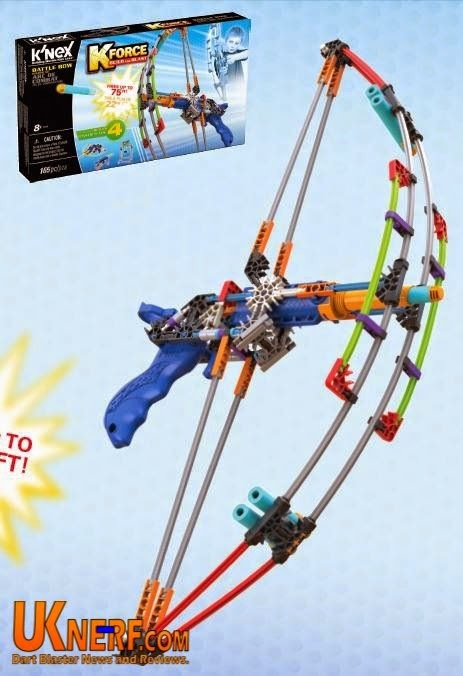 I really love the attitude that K'nex have with regards to these products. They are not after a slice of the blaster market and they are certainly not interested in competing with Hasbro. These products were simply designed in response to customers building blasters out of their construction sets. They saw that there was a culture of people creating something so they designed a product to facilitate it.